It appears I never gave this show a proper introduction. In fact, the introduction to this show spans 30+ years. So, to summarize… We had Johnny Carson on The Tonight Show and Dave Letterman on Late Night on NBC starting in the 60’s and 80’s respectively, and essentially running through the very early 1990’s. They really got this whole thing started with late night television while the other networks were failing at those time slots. Then Conan took Late Night when Dave went to CBS, Leno took over for Carson, and Tom Snyder and Craig Kilborn took a few years at the helm of The Late Late Show that was created as part of Letterman’s deal to create the late night slots on the network. Once Kilborn decided to leave, Craig Ferguson came into the picture and we had what was to be a relatively solid late night lineup, save for a couple hiccups at NBC, for about a decade. But things would eventually start to change. With those hiccups at NBC, Conan got pushed into cable on TBS where he is still happily hosting Conan and NBC would essentially become the SNL network with Jimmy Fallon and Seth Meyers taking over The Tonight Show and Late Night respectively. I consider Craig Ferguson to be one of the pioneers of late night since his format, although trying to emulate its predecessors, was essentially a one-man show, without a band for its entirety, or a sidekick until its last few years. He was the longest-running host of The Late Late Show on CBS since its inception. He quickly grew to become one of my favorite hosts among Carson, Letterman, and Conan. Then Letterman announced his retirement. And then so did Ferguson, who surprisingly set his retirement date months before Letterman’s. And holes were left to be filled with more new talent. Now James Corden is the host of The Late Late Show, and Stephen Colbert takes over CBS’s Late Show in a couple of weeks. Luckily we have an experienced player coming into CBS’s Late Show, but we don’t know how it will be run. Corden has changed the format to one more familiar with British audiences, akin to Graham Norton’s show. And so that is where we are right now. You can’t have a show without a production team. Luckily, I have two people so far, who I had met at Playlist Live Tri-State last year, helping me with various tasks including producing, coordinating and researching talent to have as guests and performers, and a lot more. We have been meeting over Skype and Google+ Hangouts (thanks to Skype crashing on me suddenly the past two days) to figure out what we are going to do to plan and shoot the pilot episode. You also can’t have a show without a production crew or shooting locations, and the equipment to make the show. 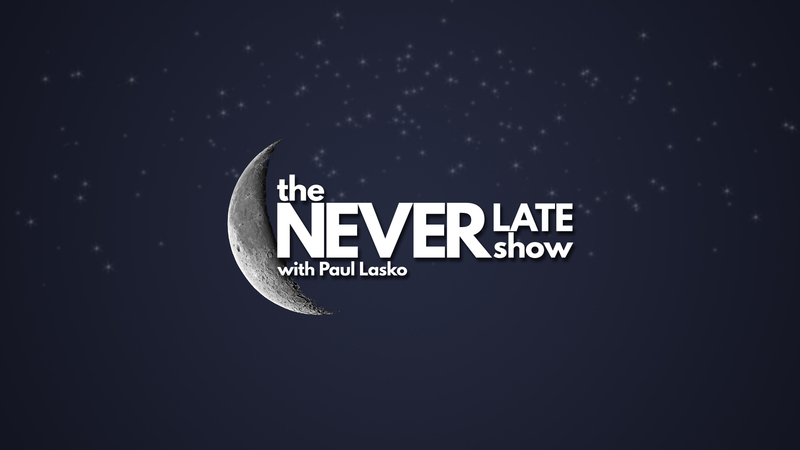 These are just a few roadblocks, or speed bumps, we’ve hit as we’re conceptualizing how we are going to do the The Never Late Show. The format writes itself as we plan to go with a traditional American late night talk show format. At that point, all we need to do is write segments and bits and come up with more fresh and funny ideas. All we have right now is a solid expectancy to shoot one episode per week with a weekend release provided everything gets done on schedule and we can meet post-production deadlines. I would love to shoot the show in front of a live studio audience. As the guy who’s going to be responsible for making the laughs, I want to know if my jokes are funny when I deliver them. I also want to know that if jokes I tell are going to bomb, that I can use that to my advantage to turn it around. Unfortunately that would cost a huge amount of money – to have our own sound stage and set. That’s money that I don’t have. I need to write up some cardboard signs. Actually, on that note, I considered crowdfunding for the pilot. But I’m not sure it would really be worth it to do that. I would really like a studio and set that could help give the show its own atmosphere, but that is something we will have to put off until the future. And unfortunately, YouTube Space, in any of its geographic locations, does not seem to be a viable facility for this kind of production. While I was writing this I actually had an idea to solve my studio audience problem. I will bring it up to my team, who I plan to introduce you to in the future. We’ll be right back. 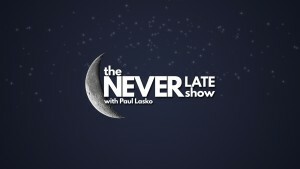 In the meantime, have this free The Never Late Show computer wallpaper (1080p). Right click and Save Link As.